Note: I am skipping the character introductions for now, and starting with the actual text, from image #7 in the National Diet Library's archives. On the first page of the text is the title (fig. 1), 「春色梅兒與美」 (Shunshoku Umegoyomi). There are a few things to note about it. First of all, the use of kana (the Japanese writing that is phonetic, as opposed to the Chinese-origin kanji, which is also used in written Japanese) was quite different at the time, and is now known as historical kana orthography (歴史的仮名遣). It did not have the small versions of kana used nowadays to indicate yōon, which are diphthongs, such as "kya" or "nyo" (note: this does not appear to be universally true, as explained in this post). It also often failed to always distinguish between voiced and non-voiced versions of kana (e.g., "ka" and "ga" or "ha" and "ba") through the use of dakuten. Since the number of people who were literate during the Edo period was relatively small, and those who were literate could afford to spend the time to learn how to resolve written ambiguities by context, this was not a big concern. Nevertheless, Edo-period writing was a big improvement in terms of disambiguation when compared to earlier writing, such as from the Heian period (794-1185), which made liberal use of references to other texts, among other things. It was not until the post-WW2 period, however, that the urgent need for orthographic reform became apparent. Nevertheless, the inclusion of furigana (kana that indicates the pronunciation of kanji) makes it apparent that this text was not targeted solely at readers with a high level of education. The style of writing used here is known as kuzushiji (see the linked PDF on that page for a relatively comprehensive list of kuzushiji). Kana started out as kanji that were used purely for their phonetic value. Over time, the kanji were written in increasingly simplified cursive forms, which led to the modern kana we use today. Kuzushiji consists of those cursive-kanji-used-as-kana written in various degrees of simplification. In the title, only the first 2 furigana, and the last one, should be difficult to read for someone who knows modern (handwritten) kana (note: in all figures, I will indicate the kanji from which a kuzushiji kana is derived in parentheses if that kanji is difficult to determine or it's the first time we're running across it). The first is the kanji 「志」, used to represent the kana 「し」. Note how the 「し」 in 「しょく」 uses a different kanji (a highly simplified version of 「之」, which is very similar to the modern 「し」) - in kuzushiji, there are several kanji that can represent a single kana. The second furigana is represented by the kuzushiji form of 「由」, which in a more simplified form became the modern 「ゆ」. The last one comes from the kuzushiji form of 「三」, which came to take on the phonetic value of 「み」 and can still be seen in the modern katakana 「ミ」. Also note the lack of standardization for kanji usage. 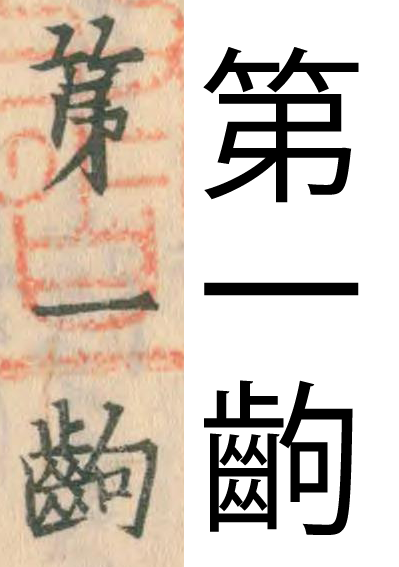 The proper way of writing Umegoyomi in modern Japanese would be 「梅暦」, but it is written as both 「梅兒譽美」 (the official title for this work) and as 「梅兒與美」, with the 3rd kanji changing. The kanji 「兒譽美」 appear to have been used for their phonetic value here, although some significance may have also been placed on their meaning. As for the meaning of the title, 「春色梅兒與美」 refers to the colors of spring and how they are a harbinger of that season. Although 「梅暦」 (in its various forms) literally means "plum calendar", it also refers to the plum blossoms that indicate spring's arrival. This is in line with the ever-present theme of spring as the season of renewal, new chances, and the beginning of new love. Despite penning a novel for the common man, Tamenaga cannot escape the shadow of his aristocratic forebears, who wrote poem after poem on the topic of the intertwined nature of the seasons, nature, and love. The text 「巻之一」 (まきのいち) refers to the fact that this is Volume 1. The use of 「之」 for the possessive particle 「の」 comes from Classical Chinese, and once again demonstrates the strong classical influence on even the vernacular written Japanese of this era. The subheading (fig. 2) states the setting, Edo (江戸), as well as the author, Kyoukun Teishujin (狂訓亭主人), a pen-name of Tamenaga Shunsui. At first I wasn't sure whether 「江戸」 referred to the setting or the place of publication, but (IIRC) the place of publication is indicated in a different, standardized place in books of this era. 「狂訓」 is a pun on 「教訓」, which means "lesson" or "moral instruction." By replacing the first character with the homophonic 「狂」 (insane), Tamenaga reveals the irreverent light in which he sees himself. The last part of the title (fig. 3) indicates that this is section 1. The third character (齣), pronouced 「こま」, is one that you might have encountered in katakana form, such as in yonkoma (4コマ). Heh, it's hard to keep these running kana aligned with the proper kanji. Haha, that's a pretty good use of these manuscripts. I've got a 筆ペン but never really used it. Have you formally studied 書道?